Venture out of the city with trips to National Museum of the Pacific War (in Fredericksburg), Barn Pottery (in New Braunfels) and Austin (Lady Bird Lake Hike-and-Bike Trail, Sitagu Buddha Vihara, & more). There's lots more to do: shop like a local with The San Antonio River Walk, take in the history at Mission San Jose, explore the fascinating underground world of Natural Bridge Caverns, and pause for some serene contemplation at San Fernando De Bexar Cathedral. To see where to stay, ratings, reviews, and more tourist information, go to the San Antonio day trip planning website . Manchester, UK to San Antonio is an approximately 16.5-hour flight. You can also do a combination of flight and bus. The time zone difference when traveling from Manchester to San Antonio is minus 6 hours. While traveling from Manchester, expect much warmer days and a bit warmer nights in San Antonio, ranging from highs of 28°C to lows of 14°C. Finish your sightseeing early on the 12th (Thu) to allow enough time to travel to Las Vegas. Change things up with a short trip to Hoover Dam in Boulder City (about 50 minutes away). There's still lots to do: don't miss a visit to Bellagio Fountains, push the limits with an extreme tour, examine the collection at The Neon Museum, and try to win big at Paris Las Vegas. To plan Las Vegas vacation without wasting time, ask Inspirock to design an itinerary. You can fly from San Antonio to Las Vegas in 5.5 hours. Other options are to drive; or take a bus. Due to the time zone difference, you'll gain 2 hours traveling from San Antonio to Las Vegas. Expect a daytime high around 27°C in March, and nighttime lows around 13°C. Finish your sightseeing early on the 16th (Mon) so you can travel to San Francisco. Kick off your visit on the 17th (Tue): see the interesting displays at de Young Museum, take in the views from Golden Gate Bridge, then take a leisurely stroll along Fisherman's Wharf, and finally explore the wealth of natural beauty at Alcatraz Island. On the next day, explore the engaging exhibits at Exploratorium and then admire all the interesting features of Golden Gate Park. Fly from Las Vegas to San Francisco in 4 hours. Alternatively, you can drive. When traveling from Las Vegas in March, plan for slightly colder days in San Francisco, with highs around 21°C, while nights are about the same with lows around 11°C. Finish up your sightseeing early on the 19th (Thu) so you can travel to New York City. New York City is known for museums, nightlife, shopping, historic sites, and parks. Your plan includes some of its best attractions: go for a walk through Central Park, appreciate the history behind Statue of Liberty National Monument, take in panoramic vistas at Top of the Rock, and don't miss a visit to Grand Central Terminal. For ratings, other places to visit, more things to do, and tourist information, go to the New York City online road trip planner . Traveling by combination of flight and bus from San Francisco to New York City takes 9 hours. Alternatively, you can fly; or drive. The time zone difference moving from Pacific Standard Time (PST) to Eastern Standard Time (EST) is 3 hours. Plan for a bit cooler temperatures traveling from San Francisco in March, with highs in New York City at 11°C and lows at 1°C. You'll have a few hours on the 24th (Tue) to wrap things up before traveling home. Start off your visit on the 25th (Wed): explore the striking landscape of Bridalveil Fall. Here are some ideas for day two: make a trip to Olmsted Point, then take some stellar pictures from Tunnel View, and then trek along Mariposa Grove of Giant Sequoias. For reviews, more things to do, photos, and more tourist information, you can read our Yosemite National Park day trip planning site . 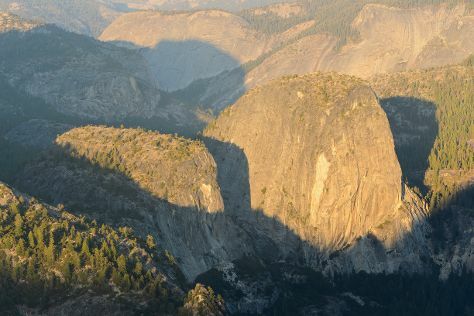 You can do a combination of bus, flight, and car from New York City to Yosemite National Park in 11.5 hours. Alternatively, you can do a combination of flight and bus; or drive. Traveling from New York City to Yosemite National Park, you'll gain 3 hours due to the time zone difference. Traveling from New York City in March, expect little chillier with lows of -5°C in Yosemite National Park. Wrap up your sightseeing by early afternoon on the 27th (Fri) to allow time for travel back home.